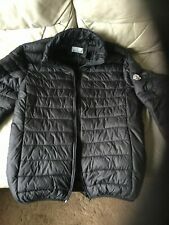 Mens Moncler Jacket Size XL. Condition is Used. Dispatched with eBay delivery – Shutl 1 day. Stylish short and cropped style leather motorcycle jacket in black. With concealed nylon hood at collar with zip for rainy weather Never been worn. Very good condition Chest size 42, L size. Armani Jeans biker style jacket . Very soft leather with three red piped pockets . Stitching on elbows . Red quilted lining slightly worn on cuffs .